In part two of The Crossover's conversation with Kyrie Irving, the Cavaliers star discusses anything but basketball once again. Among the topics: books, politics and spirituality. 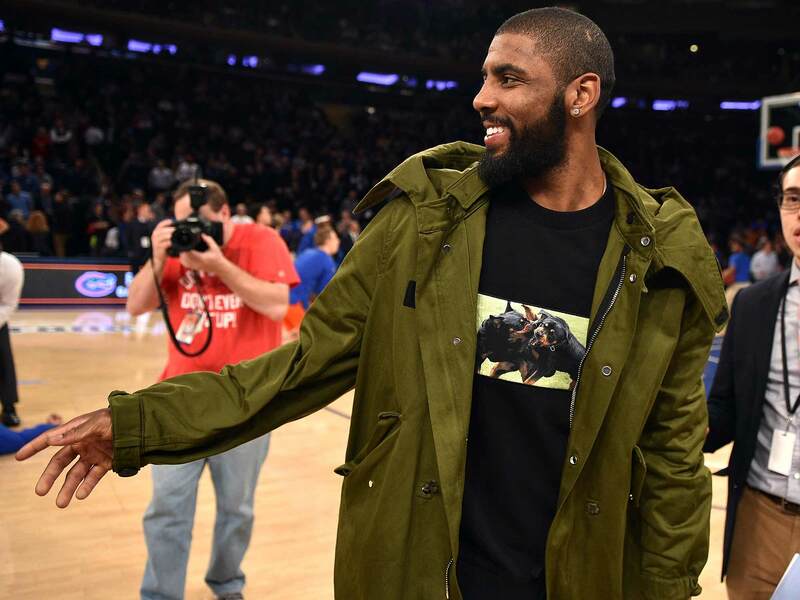 Before the start of the season, The Crossover caught up with Kyrie Irving and found out how reading had become an essential part of his journey to self-discovery outside the game of basketball. Irving passionately told The Crossover that the hours he’s not playing basketball still have to matter to him, and that he hopes to be a role model for the next generation. We caught up with Irving again last week, and the Finals champion is still working hard to improve his life away from the court. 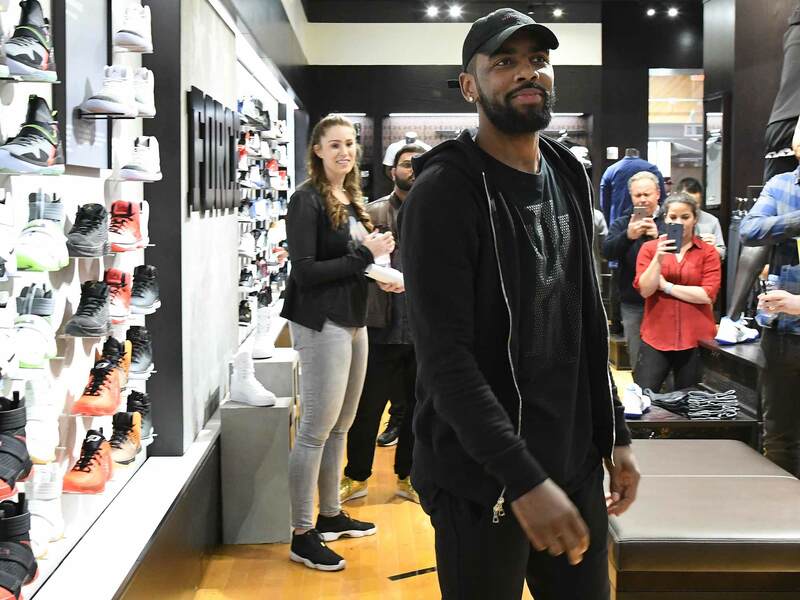 Irving sat down with us at the brand-new sprawling Foot Locker store in Times Square, which opened to the public Thursday. After giving us a tour of the new store, Irving chatted with us to talk about his latest reading habits, how he views his already stacked list of accomplishments, and much more. Kyrie Irving: For your new NBA page, right? Of course, of course. That was awesome. RN: Great! So in that spirit, we just want to talk about what you want to talk about. What’s going on in your life these days? KI: [Laughs] Nothing, man. Just really still reading. I’m into audiobooks now, taking notes down. I’m reading [Jiddu] Krishnamurti’s books now, understanding what his book Total Freedom is about. It takes me on a loop man, it takes me on a loop. I’m really trying to live, fulfilling every single day. It’s really challenging, because you add another component like basketball to it, that is also part of my life. My direction is still being discovered, which I’m pretty excited about. KI: Sometimes. I have been really, really—it may sound bad—but I have been programmed by my dad in the foundation that I’ve been given to really appreciate it for the moment, and then now we look on to the next thing. It’s like a part of me, I’m still trying to learn how to really, really appreciate those things because years and years from now, time really waits for no one. So now you might as well enjoy it now. But there’s just so many things going on, and to honestly live moment to moment, I feel like that’s the best thing for me. Those are great accomplishments, I wouldn’t be able to do it without my teammates, my coaching staff, without people just allowing to be in a position to be myself. And as well as me powering through to be myself in those positions. It’s part of the journey. Then I move on. RN: When there is so much attention on you as a basketball player and what your team is supposed to do, what drives you to still kind reserve those personal moments during the season? KI: Love, man. Love and desire to really exhaust every opportunity to its fullest potential. I was reading, and I was thinking I have the courage to be who I am, to not fear, I’m thinking all these things and I’m like, 'OK, why the hell am I not applying this to basketball?' If this is everything that I want to be, and greats have done it before me and people are doing it now, then why not go for it? Why not be all in no matter what? There are things that are going to hold you down, things that you are going to go through. But why not make a choice to just be that. Why would I worry about what anyone else says or what anyone thinks I should be doing? Why even play with my thoughts that it would really stop me from achieving what I want to achieve. So make a choice. And I made one to be me all the time. Go, go. Don’t look back. RN: So you mentioned a new author you’ve gotten into. ​KI: It’s Jiddu Krishnumarti. He’s an unbelievable speaker. I’ve been reading Total Freedom, which was given to me by Jacob Rosenberg, who’s a skateboard filmer, which is, I ended up talking to him in the summer, he gave the book to me, I ended up reading, it’s crazy how this world works sometimes. RN: What has the book taught you? KI: It’s teaching me about self-pity. It’s teaching me about being aware of me but also what’s going on in society. It’s really tying a huge knot around what I've been grappling with for so long. Realizing that so many things I’ve gone through in my life have really fixed it to be this particular picture that I’m making it. I wouldn’t want to slice it up any other way. I think about where my family comes from, where my friends come from, how many people I’ve met, how many books I’ve come into contact with, how many conversations I’ve had, thinking about where we are now, and now look how it’s almost come full circle with us talking about it. It just puts a lot of things in perspective in terms of my life and what I want to represent. KI: Which it should be. It should be that, it should be that. RN: Does all that’s going on now affect you at all? How do you feel about it? RN: But it is influence. KI: People are looking up to you and you’re able to find knowledge and see what’s important to you. Usually, reacting the first time emotionally is the right thing to do. I really have to take a step back, because one particular thing of what could be right isn’t right. If you start breaking it down between what is right and what is wrong, the fact that it is an opposite, the fact that you can say this should be this way, the fact that there’s an opposite means it’s not right. It’s really about being truthful. And that truth somehow just gets lost. And for me, my job is to really acquire all that knowledge so that when I’m able to speak about it as much as I want to, and as much I can, and to ultimately be the leader of the generation, and the leader of not just a revolution but a change that needs to happen, then I want to be prepared for it. So that’s all I’m really particularly doing. And like I said, I have a huge, huge responsibility with basketball. When you’re trying fumble with dealing with life all the time, as well this “basketball lifestyle,” you gotta deal with both. I’m just trying to prepare as much possible, but also knowing I stand for what is true. And what’s going on in this world is obviously just ridiculous. RN: Okay, I want to end with a basketball thing. For years, NBA players didn’t really care about the first half of the All-Star game, but at least it got competitive toward the end. That hasn’t even happened the last couple years. I know you’ve been MVP before. But please tell me you guys are going to try this year. KI: I didn’t even watch the game last year. We actually—I’m not saying the guys in the past haven’t been as competitive—but have some guys that are really, really thirsty for some competition and want to go at each other. Think about how packed the East and West are. This is a chance for everyone just to really go at each other. That’s what everyone wants to see. And that’s where I come from, that kind of culture.